I figured I would pump out a wee blog post, as I haven’t done one for ages and I do want to keep this blog alive, even if it may not seem that way to casual observers. I’ve been struggling a bit recently with a commission and it’s been sort of depressing, painting and repainting and losing the rag and DESTROTING EVERYTHING and starting again and again and again. It’s eating up most of my time and I don’t have very much new or exciting to show so I thought I would throw up some copies of paintings by proper artists that I’ve done as learning exercises at various times. 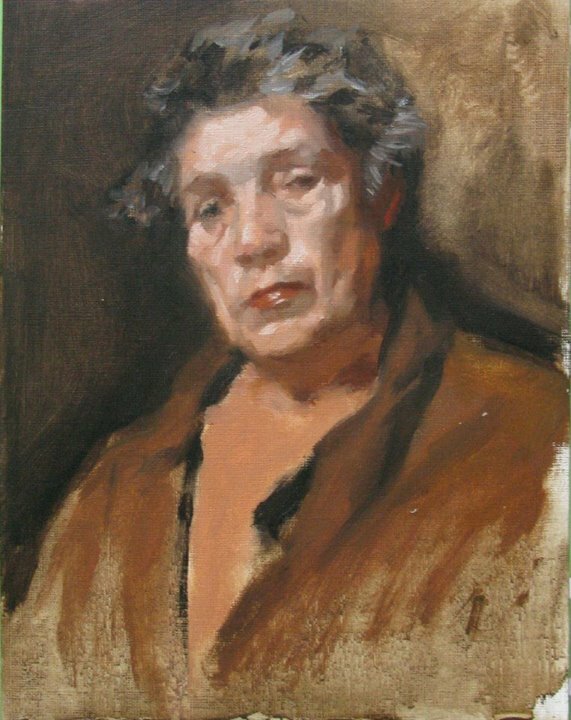 Copying great works is a fantastic way to learn, especially if you make the effort to replicate the artist’s approach, analysing the way the colour is applied and trying to recreate the process. It’s like having the artist standing beside you as you paint, taking you through the process step by step. I’m a big fan of the loose, brushy style of artists like Velásquez and Sargent so those are the painters I’ve spent time copying. 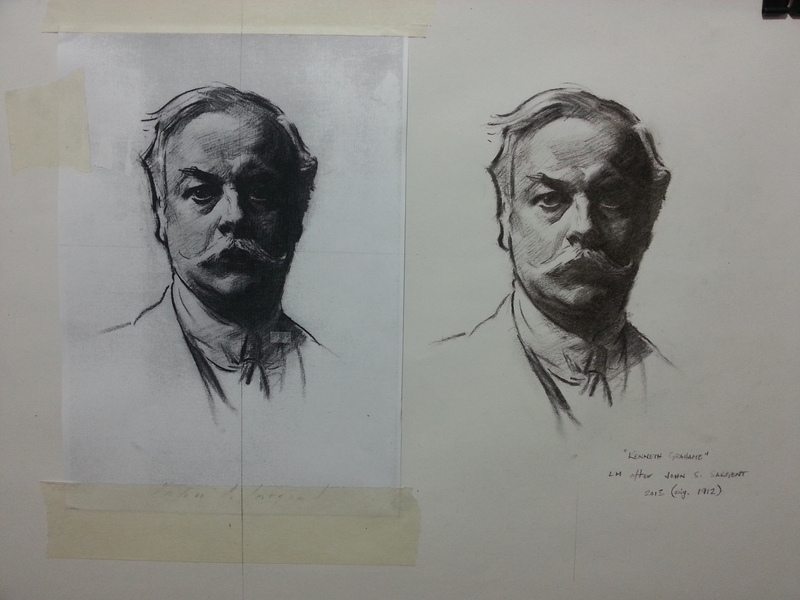 Below are copies of “Head of a Capri Girl” (Sargent), the head from Velásquez’s “Aesop”, Sargent’s “Bedouin Arab” and a charcoal portrait of the author Kenneth Grahame, also by Sargent. 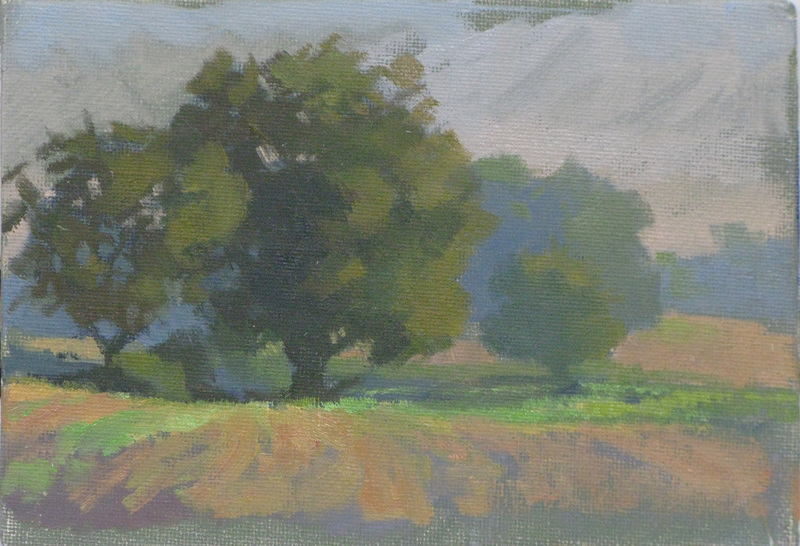 These are all little – about 12 x 16cm I think. A quick update at the beginning of week three in Florence. 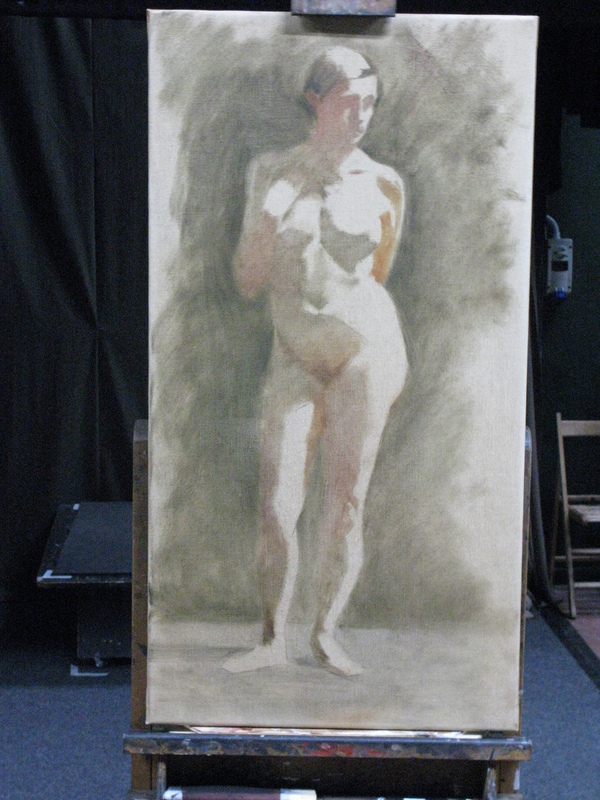 Last week we finished our value studies and got back to work on our large paintings. 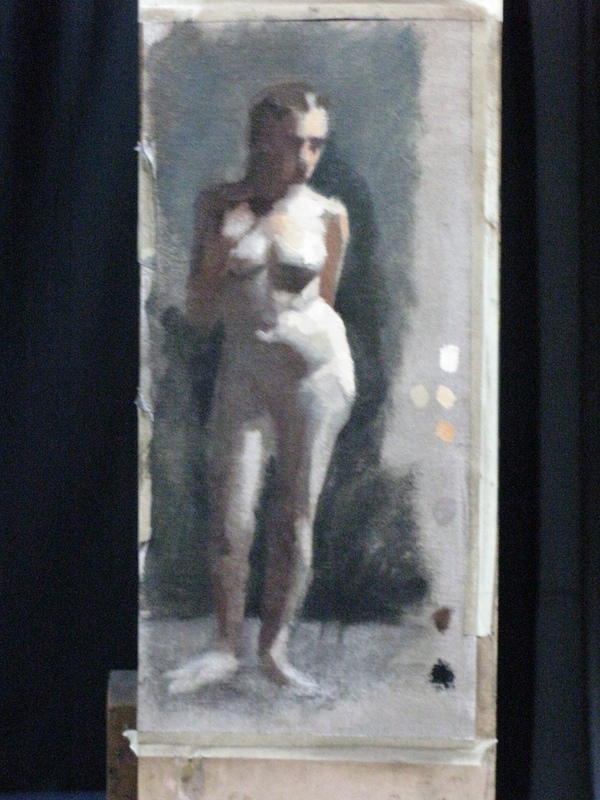 I’ve found it a bit of a struggle to be honest – as the conditions outside the studio change, so too does the spectral content of the light and therefore the colours visible on the model. The result is that you are often chasing colour harmonies around from day to day, as the light shifts from cooler to warmer and back again. Not that I’m blaming the weather. At the moment, my tones look pretty disunited, and I am going to have to work hard this week to nail the big look. Full size painting, after some scraping. Eeesh. In the afternoons I’ve been working a bit on my cast drawing, and I’ve been trying my hand at some more plein air painting in the evenings. I forgot how hard that is. The more I try it, the more I have respect for landscape painters. The trick (I think) is in picking out the really salient stuff, to give the broad impression of nature, without getting caught up in inconsequential detail. That’s a lot easier said than done though. Dare I say there is an “art” to it, ha ha. I’m not bad at leaving stuff out, but not so great at picking the right things to put in. So it’s that time of year again. A blog post. And this should be a good one – at least in terms of content, if not delivery. A fair amount has happened in the twelve months since my last post, but I’ll spare you unnecessary details, and concentrate on the most recent stuff. I’m going to keep words to a minimum as I’m writing this on my cellphone – the reason being that I am in Florence, and therefore away from my PC, on which more later. 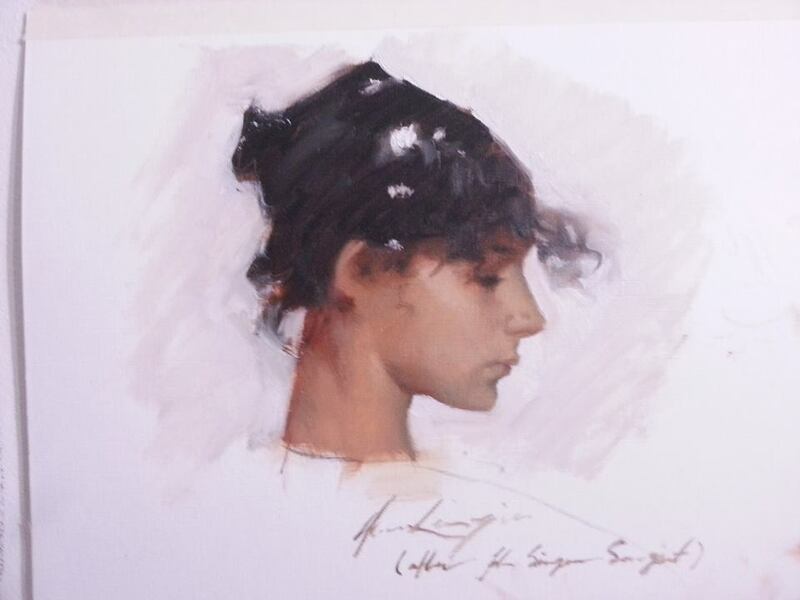 The first big thing was that my work was shown in the Royal Society of Portrait Painters annual exhibition in May. That makes two years running. I had a shoe-in this year because I was shortlisted for the Bulldog Bursary last year, and therefore didn’t have to go through the selection process. My painting was of my partner Heather. At 100 cm x 50 cm, it’s my biggest picture yet, although still not that big in the grand scheme of things. It took a lot of scraping off and repainting to get right, as errors seem to get amplified at increased scales. 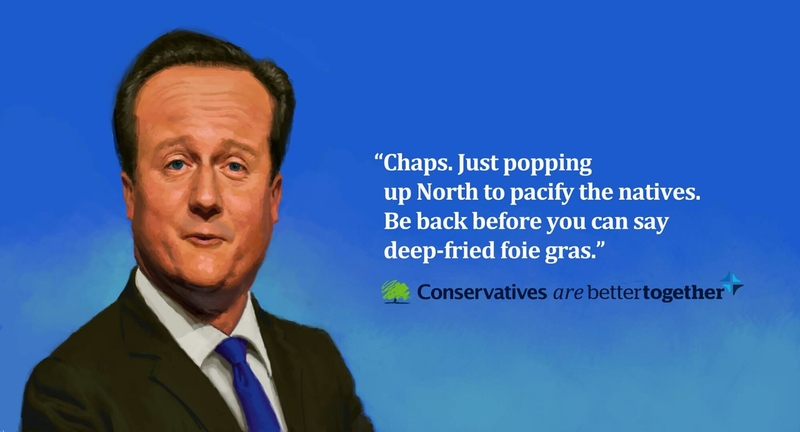 It worked out OK in the end though, I think. 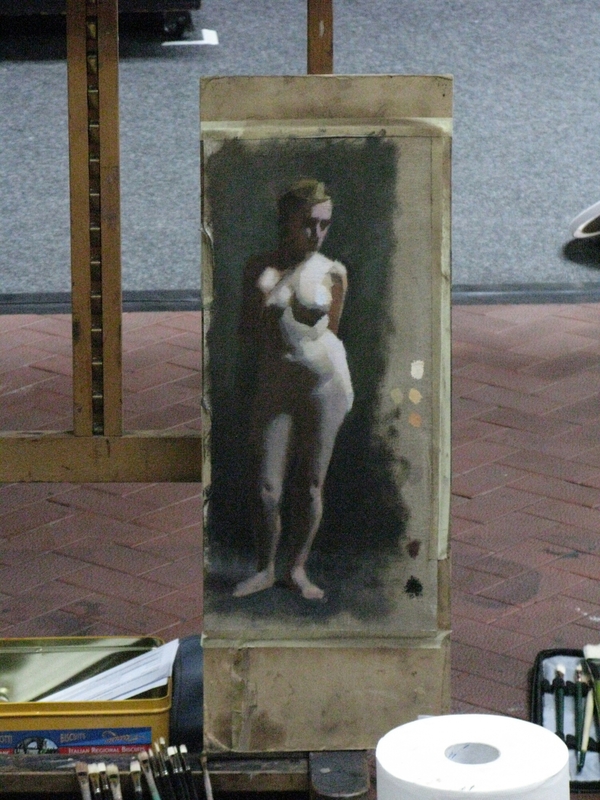 More recently, I received an amazing offer to study figure painting for one month in Florence, which is where I am now. 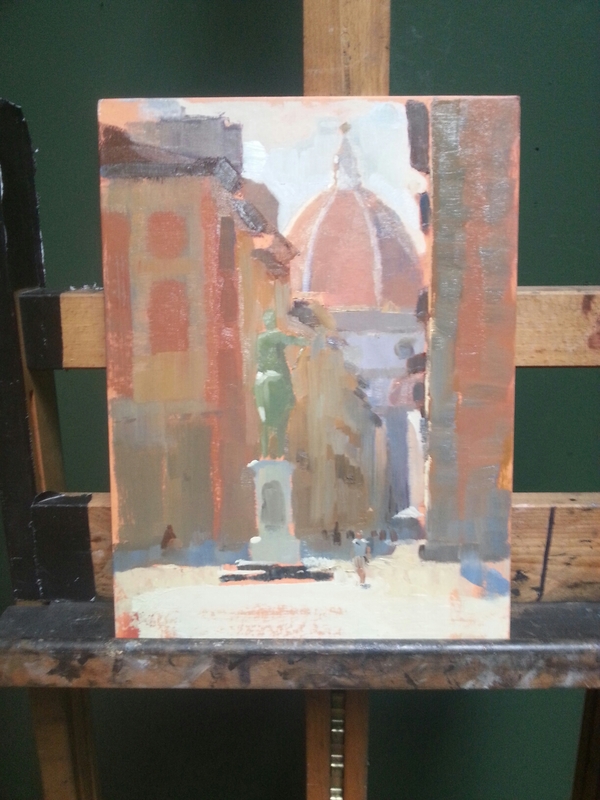 A couple of months ago I decided to take a punt on entering the Summer Scholarship Competition for the Florence Academy, thinking I had very little hope of winning, but that I might have an outside chance of making the list of finalists. As the 14 finalists were announced, one by one on Facebook, and they all turned out to be pretty amazing, I recalibrated my expectations accordingly. 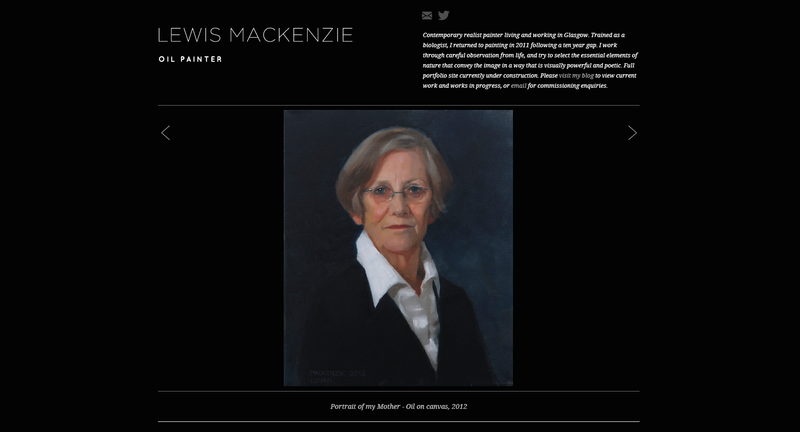 So it was a bit of a shock when my portrait of Heather popped up on their page, identifying me as finalist number 12. I was stoked, but still didn’t expect to win and I didn’t. 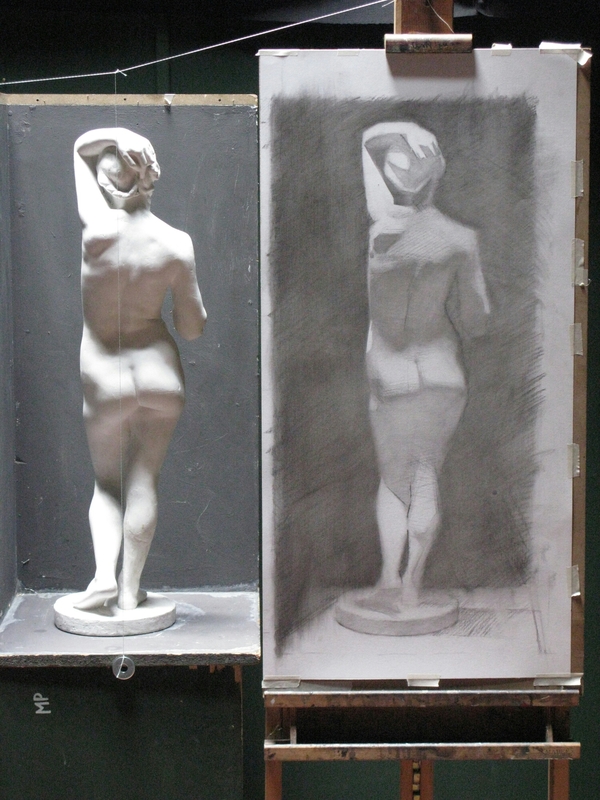 The winner was Guillermo Perez from Spain, who had submitted three amazing figure and portrait drawings. However, the judging was obviously a close-run thing, because shortly after the winner was announced, another announcement was made: Due to the high standard of entries this year, the school had decided to set up special figure painting course for all the remaining finalists. After selling a kidney on eBay to pay for accommodation, etc., I jumped at the chance. And here I am. 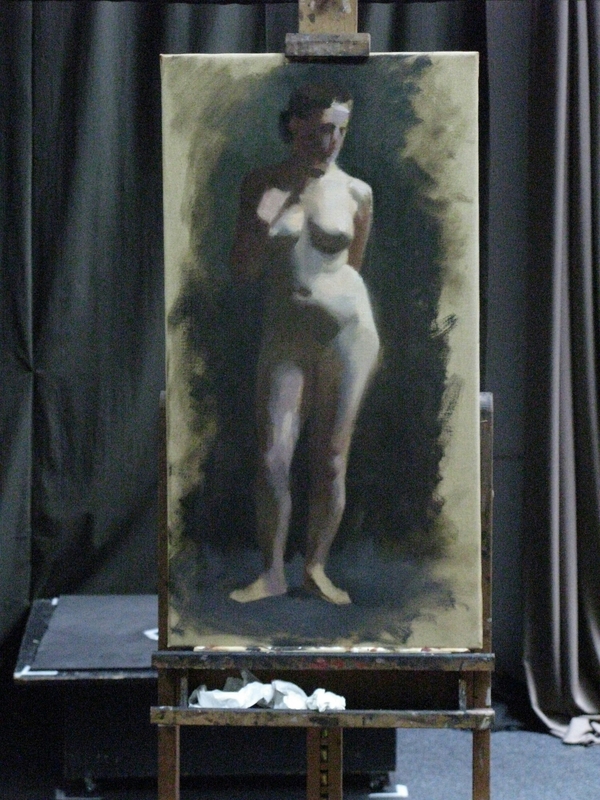 The course is four weeks painting the figure in contraposto. It’s the first time I’ve done long pose figure painting, and i am really relishing the chance to study the model in depth. The first week of classes has been absolutely great. Our teachers are Maureen Hyde and Vitaliy Shtanko – both of whom are amazing realist artists and great tutors with very different but complimentary styles of teaching. Maureen is very down to earth and gives terrific advice about how to think and solve problems for yourself, whereas Vitaly is more technical and will tell you where your drawing is wrong and how to fix it. 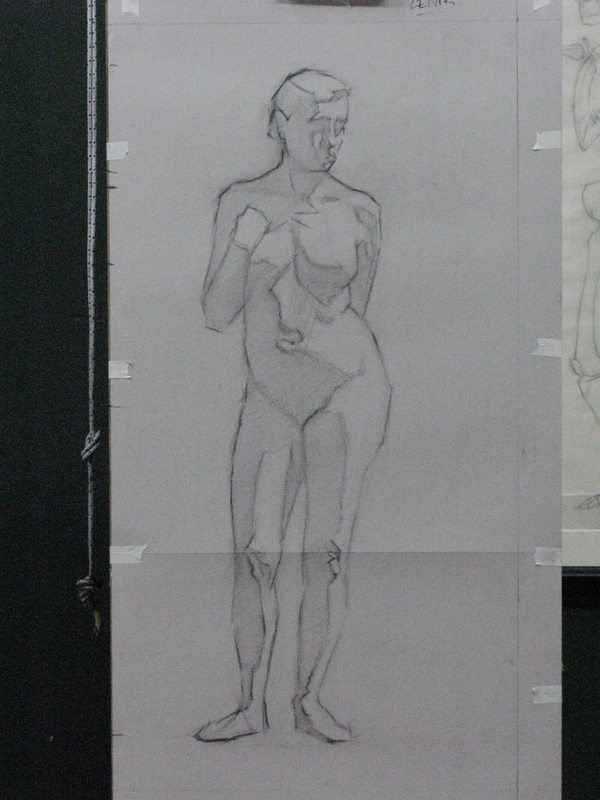 Last week, we started with a pencil study of two days to get familiar with the pose, and then spent three days on a large charcoal drawing which we transferred to canvas yesterday and began painting. 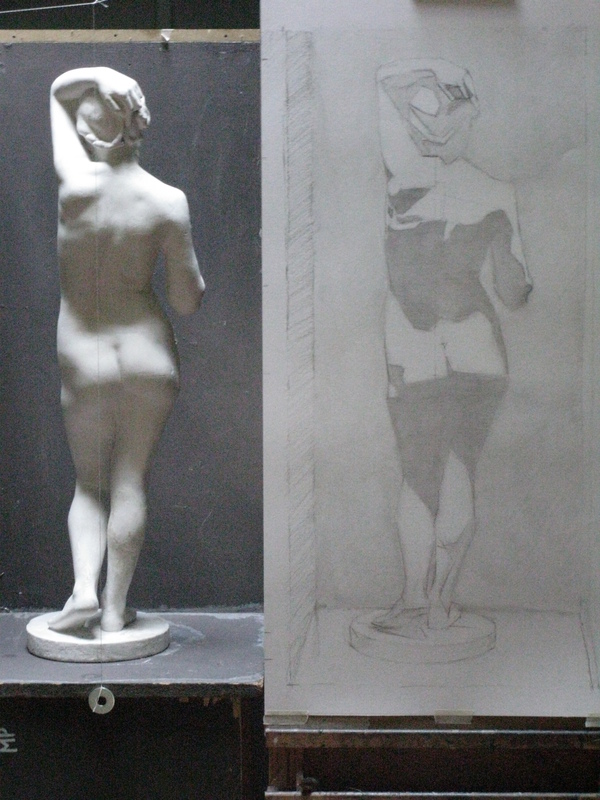 Even in this short period, I’ve learned a huge amount about how to approach the figure, and the experience in general has been invaluable. And it’s as much to do with working together in a group with like-minded people as it is to do with the teaching. It’s a great group of people, and it’s really fantastic to have the chance to learn from one another, feed off one another’s energy and so on. In the afternoon we are free to use the studio spaces for our own purposes, so most of us are hanging around to work on cast drawings, sit for portraits and share ideas and techniques. Bene. Pics below, and updates to follow. 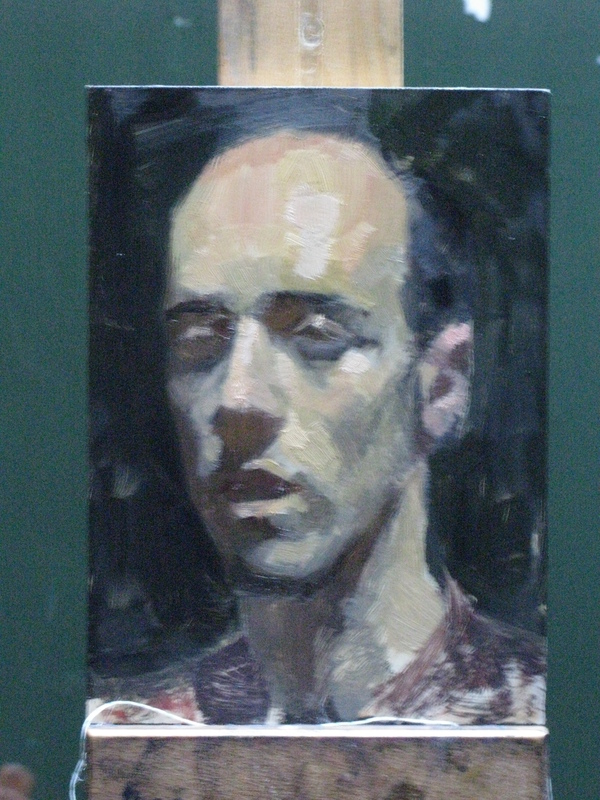 2 hr portrait study of my cazzo flatmate Justinas Krasuckas, about 24 x 18 cm (I think). I stole the above joke from Stapleton Kearns. 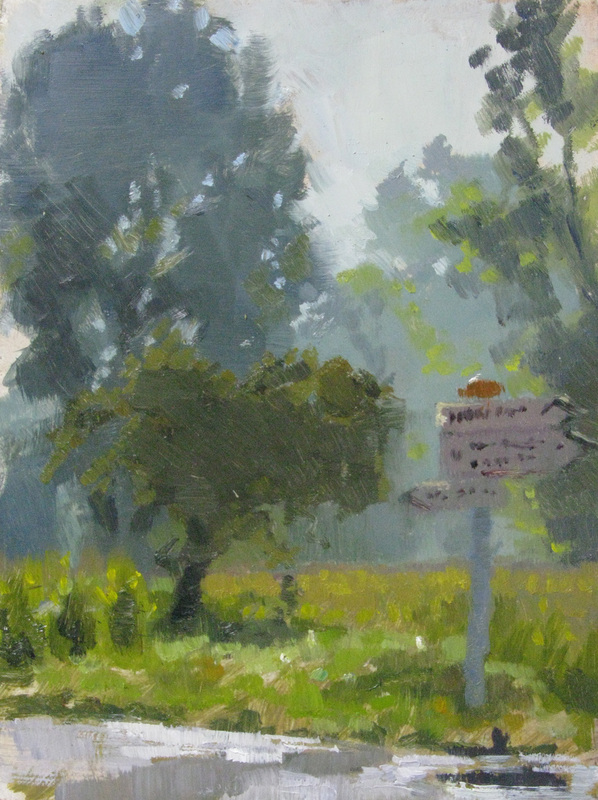 His blog on landscape painting (and painting in general) is a must read for anyone who wants to learn about the craft, and the art of painting. It covers everything from materials and techniques to art history and philosophy, as well as a little rock & roll and plenty of advice on neck tattoos. There are hundreds of posts – almost all of them written at a rate of one a day over the course of about three years, with very few missed posts. It’s also piss-yourself-funny at points. I read the whole thing from beginning to end last year and learned a hell of a lot. I’ve just returned from a ten day holiday in France. 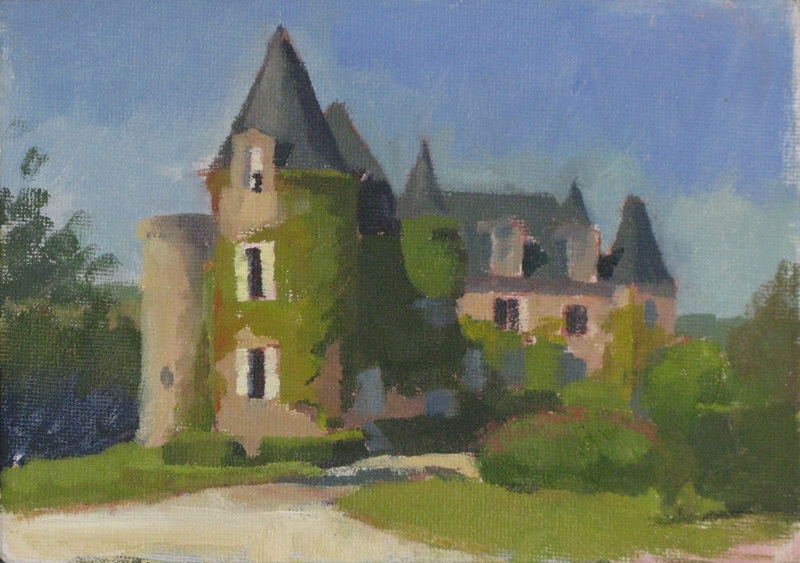 We spent a week in Burgundy and then three days in a gite in the French Alps. 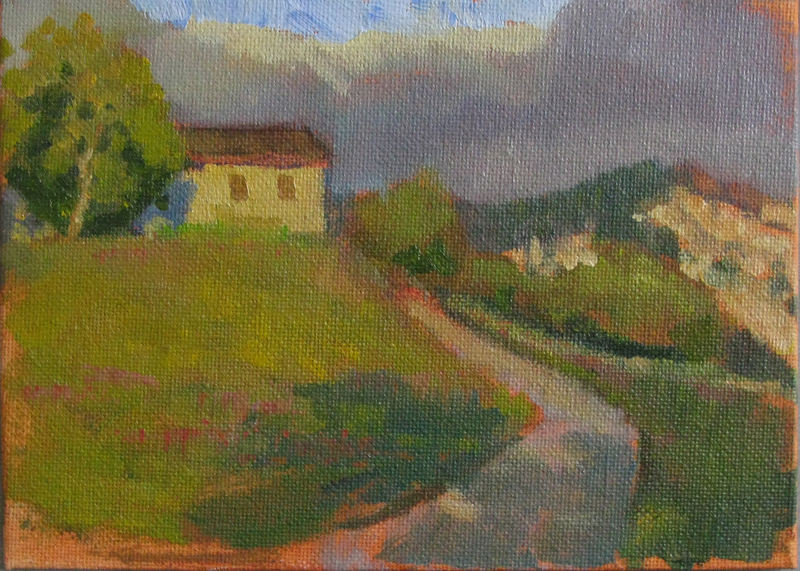 I took my painting gear and had hoped to try my hand at some plein air painting, but the weather was pretty miserable most of the time. Nonetheless I had a few opportunities to get the easel out and attempt to apply some of the lessons from Stape’s blog, with varying degrees of success. I haven’t really tried to paint landscape much before. In fact I can only remember one occasion several years ago, and the result of that was truly awful. 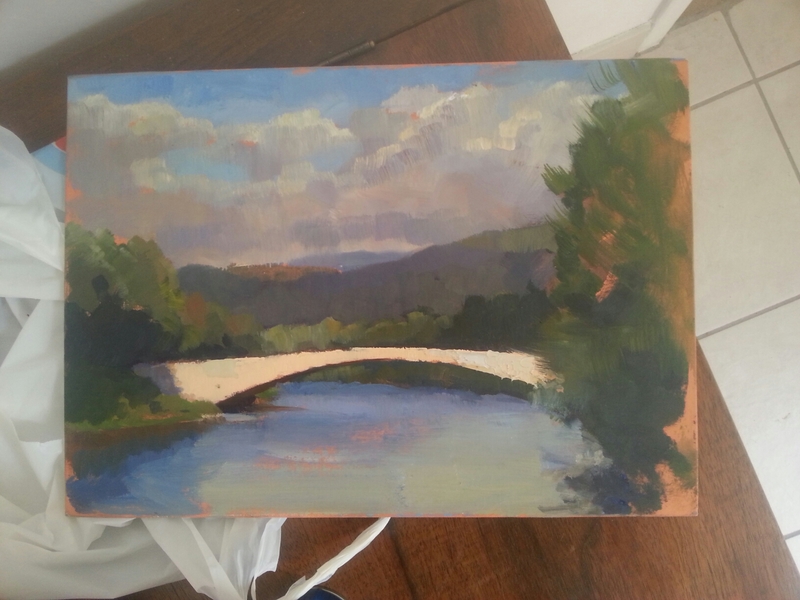 I think I did better this time around, although I don’t think I’ll be invited to give the key note address at any landscape painting conventions any time soon. 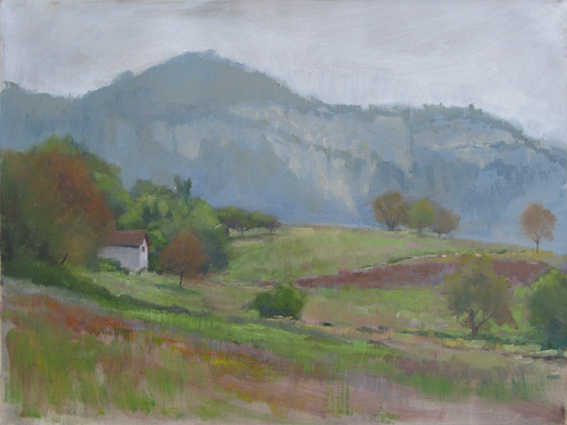 Landscape painting is a lot different from studio painting. You have to deal with changing light throughout the day, there’s a much greater range of tonal values outside than in the studio and you have to find a way to effectively express them on the canvas with paint, there are all sorts of fleeting atmospheric effects that you can end up chasing around the canvas for hours on end, and just the practical challenges of marshalling all your gear in the out doors can be quite trying. The hardest thing though, is trying to take the elements of nature and arrange them into an effective design. I had a couple of goes at this, but for the most part, the pictures I made are “paint-the-day” efforts. The look pretty much like what I was looking at, but they lack much in the way of drama or mystery. They are not terribly poetic. Anyway, here they are in chronological order. All of these were painted with a six-colour primary palette, comprising a cool and a warm version of each colour. I used pthalo blue, french ultramarine, alizarin crimson, cadmium red, gold ochre and cadmium yellow pale (and titanium white alkyd, to speed drying times). This was my first go. The weather forecast was not good, but I decided to chance it anyway. Sure enough, after about two and a half hours it was pelting rain on me and I had to hold the easel down with one hand because of the wind. I carried on for about half an hour after that before calling it quits. It’s kind of crudely drawn, but the arrangement looks OK, I think. I think it could use more red in it. Painting number 2. 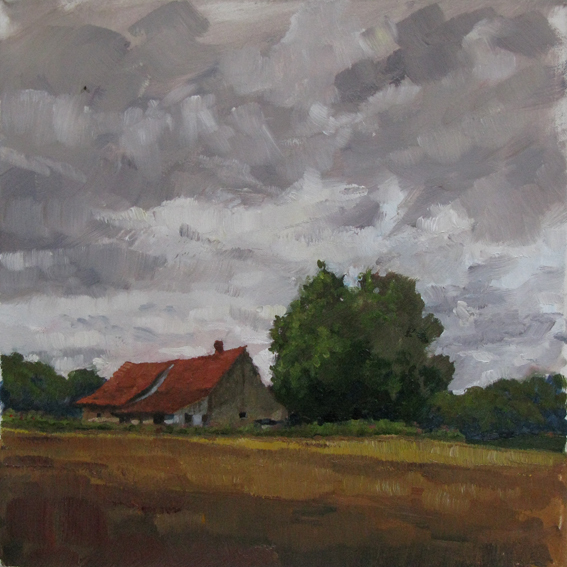 This was a slightly better day for painting – mostly just cloudy, with patchy rain here and there. I love these little farm houses in burgundy, they are all roof and tiny wee windows. Apparently the style of architecture is called bressan. I quite like this one, although it’s a pretty “commonplace” view of the subject matter. 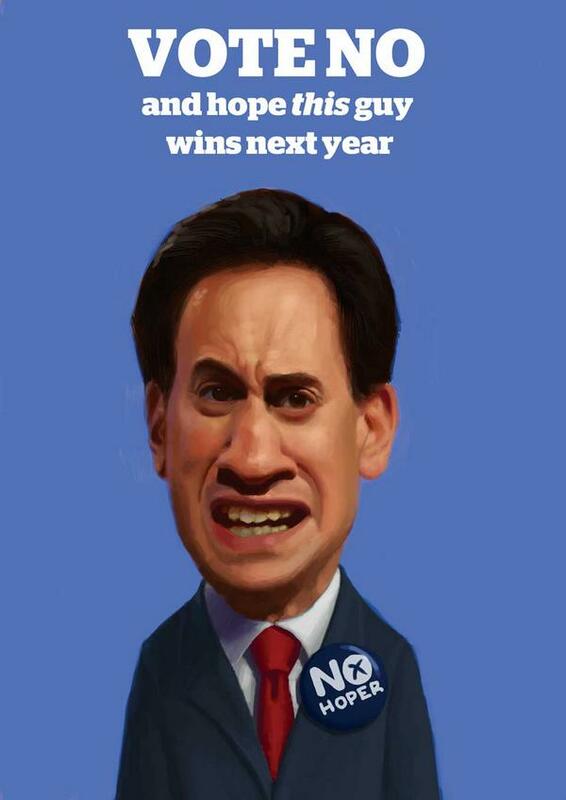 It’s fairly well drawn anyway. 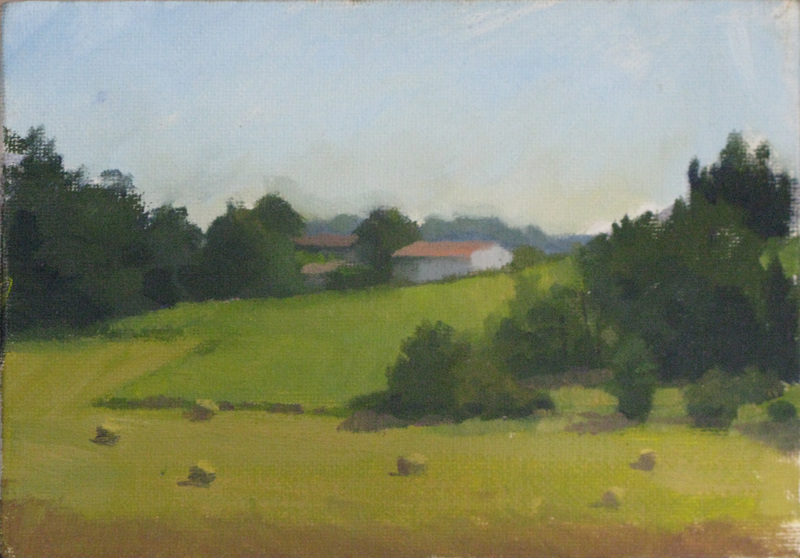 I put put a dark band in the foreground to try and get some recession into the painting, although I think it could maybe do with some ploughed furrows in perspective, leading the eye up to the house. Towards the end of the day, the clouds began to break up a bit and at one point the sun threw a bright band of light across the field just in front of the house, which I tried to put in but I didn’t really get it right. I can’t quite figure out if the sky is moody and I like it, or if it’s a bit drab and I should throw some blue into it in the studio. In any case, I tried to put some perspective into the clouds to pull the eye to the focal point, which I think worked pretty well. That’s it for the Burgundy paintings. “La Clementine” was the name of the gite we stayed at in the french Alps. I had to do some major geo-engineering to get those cliffs into the frame – they were actually much farther to the right. 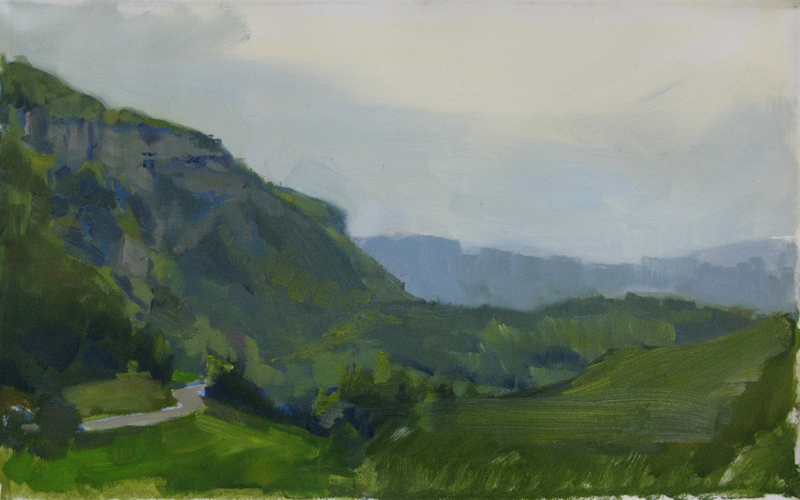 I definitely want to fiddle with this one in the studio – get some misty effects swirling around those cliffs. I might tighten up the drawing of the cliffs too. The little group of three trees on the hill bothers me, they’re all a bit similar. There is something a bit “meh” about this one, but I feel as though I could get something decent out of it. I like the colour and the handling of the foreground in particular. 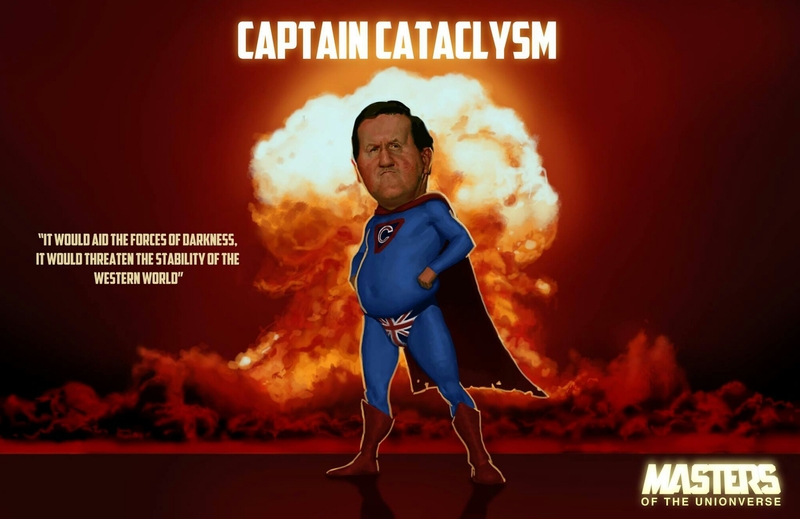 This is the best of the lot, I think. 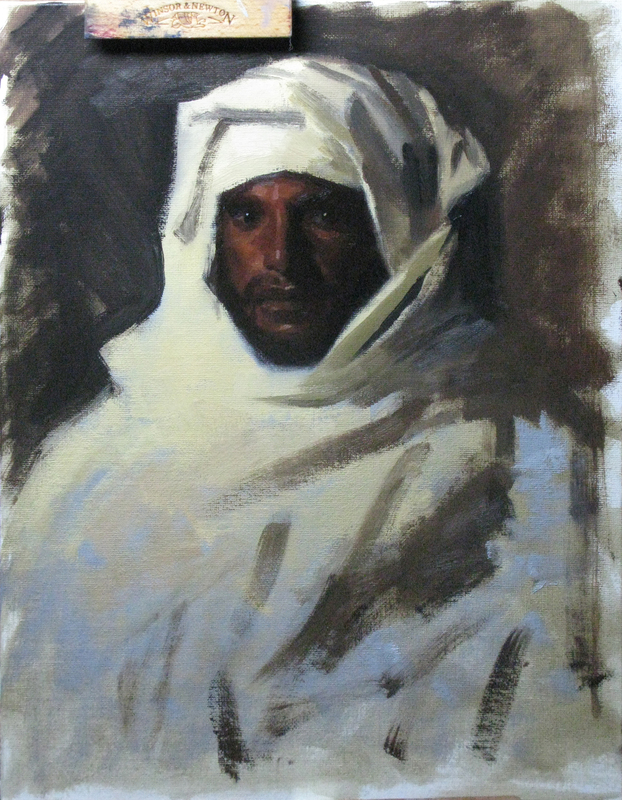 A one and a half hour sketch painted in the evening of the same day as the previous picture. I was painting with the sun at my back, and nothing but my body to block it from shining directly on my support (which is very bad practice, by the way). So I was worried that I might have judged the colour poorly, but it turned out OK. 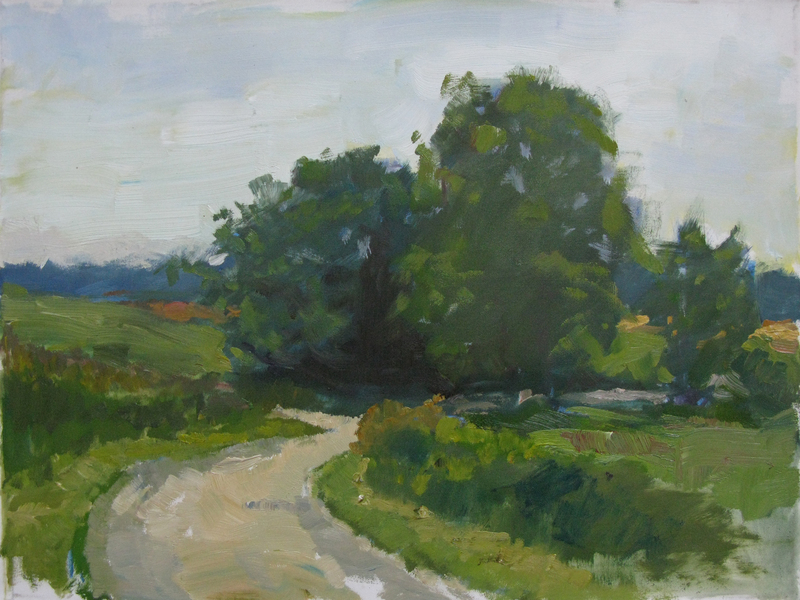 This was the day I’d been waiting for all holiday – the forecast was great, and I was raring to get out and paint. 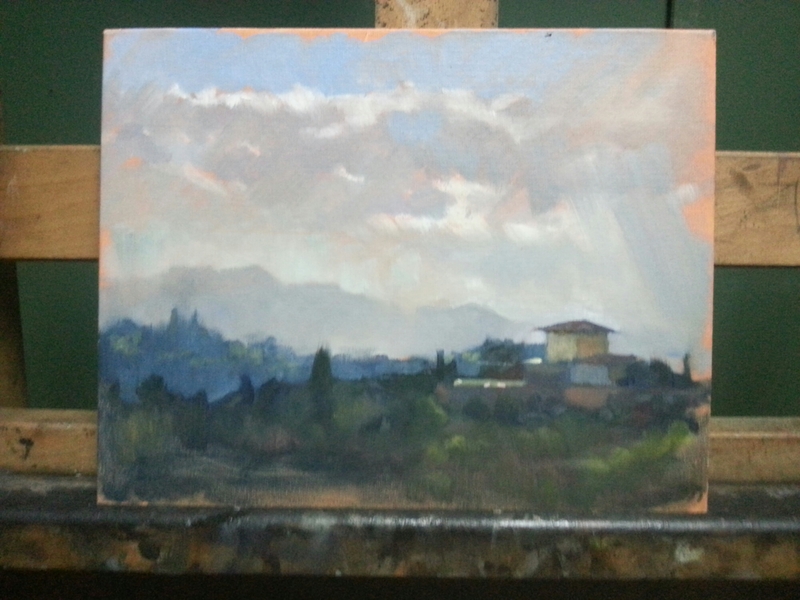 I pitched my easel by the side of the road and set out to capture this majestic view past the cliffs, across the hazy shimmering valley below, towards the Swiss Alps beyond. And made a total hash of it. There’s not much to say here – I bit off more than I could chew. The cloud cover was constantly changing throughout the day and I kept chasing effects across the canvas all day, rather than setting out my design and sticking with it. 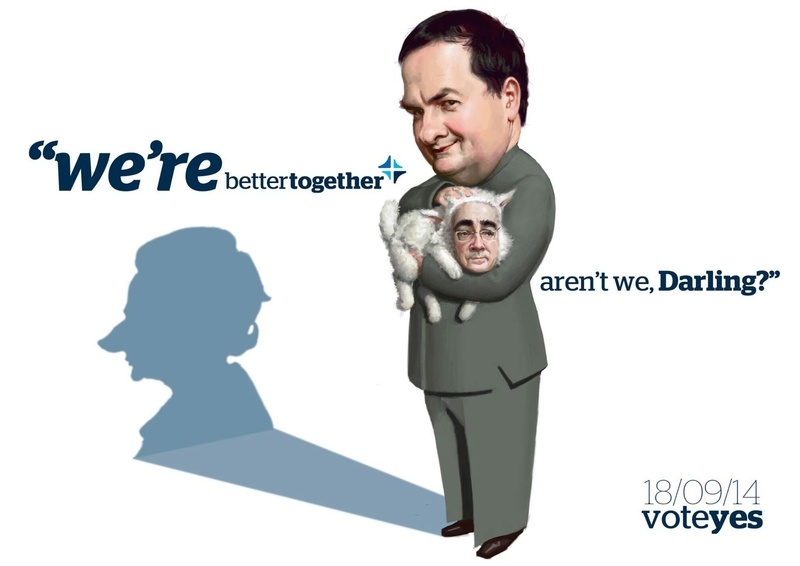 Ach well, until next time.